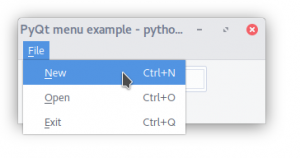 Do you want a menu in your PyQt app? Pyqt has menu support. Almost every GUI app has a main menu at the top of the window. Adding a menu works slightly different than adding widgets. A menu can contain sub menus, they are usually something like (File, Edit, View, History, Help). Every menu has actions.